Man, I feel like a little girl listening to that Glen Keane talk. He's so passionate and accomplished that I just can't help but be mesmerized. So yeah, huge helpless fanboy here. I imagine working with him on Rapunzel has to be an experience the likes of working with John or Brad. Anyway, I'm thrilled the guy's got a directing job and wish him the best of luck. I can't wait to see what he does on that film. 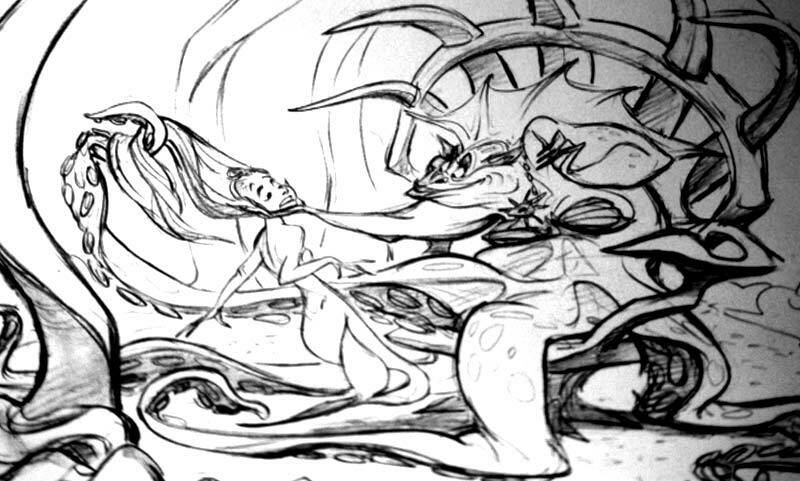 And hopefully we can get loads more of his drawings in a Rapunzel artbook/dvd. What to do when you see Glen Keane's artwork - right click 'save as'. A-freakin-mazing! I've listened to that interview so many times. Have you seen that video of him speaking on youtube? It's pretty cool. I watched him talk on the extras on the Spirited Away DVD and it was cool to hear him praise Miyazaki. I listen to him speak where ever I can. I too am a huge helpless fanboy of Glean Keane. Very good post. I'm glad you've found goodness in the Animation Podcast as much as I have (and most likely a lot more out there). I do like the Eammon Butler one a lot, but like you, my fave are definitely the Glen Keane ones. Definitely hats-off to Clay for that (oh, and Jobs for the iPod)...Great post. I know Glen Keane since Tarzan. I love this Man behind the Animator... Once a while a saw an Interview with him here on German-TV as Tarzan was coming new to the cinemas. Man, he knocked me down with his love in Animation.He talked about the scene where Tarzan met Jane the first time. He described that this was an very difficult Scene where he has to make it believable that Tarzan met a other Human being the first time. He remind the birth of his daughter and how he has feel the moment where he touched "this little human being" the first time. After this interview i fall in love in Animation because animation became more for me than just flipping papers with tiny drawings...it just like you draw your essence of life on paper. Hello guys I must say seeing you guys just talk about Glen and he's work and passion for animation just motivates me more to learn about he's philosophy of art and animation and to challenge my self to go further beyond my limits. Because I only fell in love with animation when I saw his work on the little Mermaid after that I new that animation is what I wanted to do.